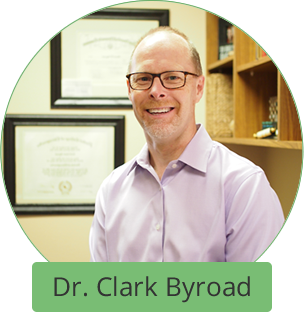 Husband and wife team Dr. Clark Byroad and Dr. Brenda Kunc-Byroad offer you the benefit of nearly three decades of experience. We welcome the opportunity to get to know you, and invite you to find out more about us! Since the young age of 14, Dr. Byroad knew he wanted to become a chiropractor. He accompanied his mom, who suffered from migraine headaches, to the chiropractor’s office for treatment. ‘’It helped her tremendously, and I thought right away that it was something I wanted to do.” Everything Dr. Byroad did in school and college was geared toward chiropractic and he never had a doubt about his chosen path. I liked the idea of helping people feel better and achieve their desired lifestyle without drugs or surgery. Since that time, Dr. Byroad has strived to stay up to date on the latest research and techniques in the health field. ‘’I love going to work every day. The greatest honor I’ve experienced is being able to help thousands of patients over my years in practice.” He especially enjoys helping patients with chronic problems who haven’t found a solution elsewhere. Certified in acupuncture by the American Society of Acupuncture, Dr. Byroad has also trained extensively in orthopedic conditions, radiology, X-rays and treatment for auto injuries. When he’s not at the office, Dr. Byroad spends his spare time with his family, including his wife Dr. Brenda Kunc-Byroad and their three adult children, one of whom is studying to be a chiropractor. Dr. Byroad loves to read and travel and is an active member of Riverside Church. Byroad Chiropractic is a member of the Lewisville Chamber of Commerce. Dr. Byroad supports Christian Community Action, Children’s Work for Children and CitySquare. 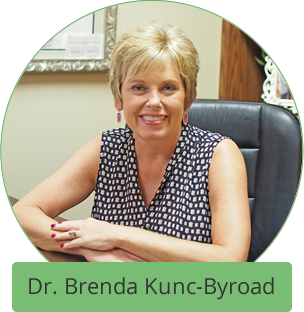 While growing up, Dr. Brenda enjoyed watching her father change peoples lives through chiropractic care. “I always wanted to be a chiropractor like him and to be able to help other people without medication or surgery.” Dr. Brenda considers chiropractic to be more of a ministry than anything as she’s passionate about serving others. One of the things Dr. Brenda loves most about being a chiropractor is having the ability to have a career and raise a great family. “I don’t see it as a job; it’s something I see myself doing until I leave this earth.” Dr. Brenda never intends to retire and can envision herself doing chiropractic forever. “Chiropractic is something I can do indefinitely and still have the blessings of a marriage, wonderful kids, and the ability to enjoy different aspects of life.” This dynamic chiropractor gets a lot of energy from helping people. Dr. Brenda originally planned to attend Logan University because that’s where her father went but she ended up choosing Parker University. As a student, she was able to see lots of different cases that were successful with chiropractic. “I was able to see patients who couldn’t become pregnant have children.” She also learned that babies, who were going to have tubes put in their ears, were able to avoid those surgeries. Dr. Brenda finds it remarkable seeing the benefits of what can happen with the body when the nervous system is functioning. She particularly enjoys helping and treating pregnant women and their babies and children. As she wants to do whatever it takes to get a patient well, be it chiropractic or another avenue, Dr. Brenda is also open to referring patients to different doctors. To give her patients additional care offerings, Dr. Brenda earned a100-hour acupuncture certificate. She also enjoys sharing her knowledge with others by doing public speaking with Pinnacle Management. When she’s not at the practice, Dr. Brenda loves spending time with her family. She also likes reading, traveling and participating in Bible studies and small groups. “I just enjoy people and having fun.” Dr. Brenda is involved in a few local charities: Christian Community Action (CCA) and Christian Works for Children. She also has supported St. Jude, which was her mother’s favorite charity. Get on the path to optimal health and wellness with natural chiropractic care. Contact us today to schedule an appointment with Dr. Brenda! Benefit from our years of experience. Contact us today to find out what we can do for you! Insurance is accepted at our practice.